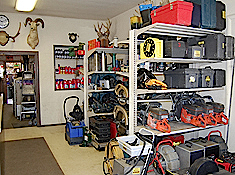 "Most people are unaware of the vast variety of expert tools available for rental from any decent rental store. The choices are mind-boggling and inspiring. Many of these tools will make a tough job easy and smooth." Looking at this list of cool rental tools points out some of the gaps in our current library. Pipe locator, airless paint sprayer, electric conveyor belt or horizontal drill and more...what would you like to use from this list? Thanks to the 16 foot extension ladder, a Tool Shed member recently got on the roof to install this flashing to form a rain diverter. The goal is to keep water from dripping onto the deck. What will you do with a borrowed tool?